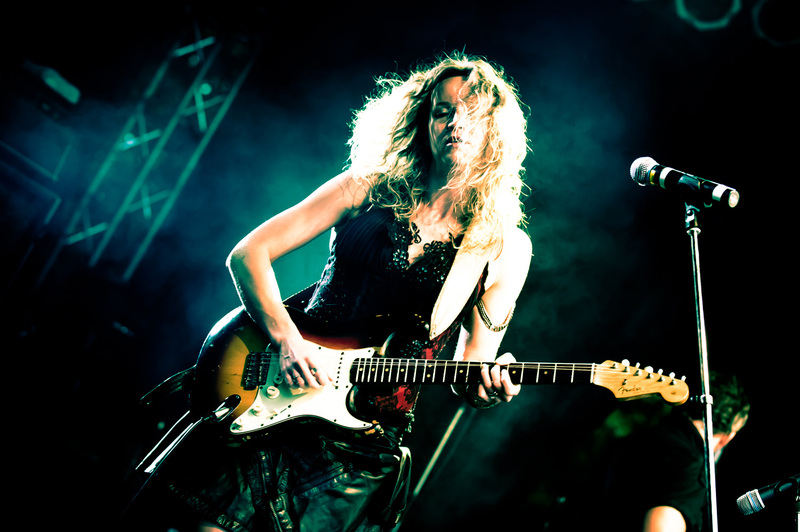 Serbian-born slide guitar virtuoso Ana Popovic will release Unconditional, 12 tracks of blues originals and covers, on August 16 on EclectoGroove Records. To get a taste of this blues aficionado, watch her perform two songs from her upcoming album, “Slideshow” and the title track, and try not to get insanely jealous if you’re a guitar player. Check out the videos, and our interview with Popovic, below. Is it hard to write an original blues song? It’s a real challenge to fit up-to-date subjects into the retro, back to the roots Delta form. Of all of my records, I’ve worked the longest on this one. I always knew I wanted to write a blues record. The simplest songs took most of the time: “Fearless Blues” seems simple but it was a tough song to write: in the Delta blues tradition, confident, up-to-date, bold but not cheesy. I wanted a rhyme, but not at all times. It was like lifting weights writing that song. Same with “Business as Usual.” It takes experience and boldness to realize that less is more, to kill your darlings and put the whole story into a couple of powerful strong lines. Straight to the point, without the usual blues clichés, that’s what I was aiming for. I didn’t just want to copy usual blues lyrics, I wanted modern subjects put into the back to the roots, Delta form. How big are the blues, and rock music in general, in your hometown of Belgrade? Rock music has a huge audience. The week I played, Santana was in town, the same evening “White Snake” and “Judas Priest” were on a double bill. After the dark times of Milosevic’s regime, the curtain has lifted and there are huge productions on a weekly basis. There’s audience for everything. Blues has smaller following but there have always been venues and bands and true blues fans in Belgrade. I was thinking about a love that’s unconditional, and what type of love that could be. I thought writing a song about unconditional love could end up being kind of cheesy, but then it came to mind that, for each of us, no matter which direction one’s love goes, if it turns out as just a thrill, or something that will last forever, love is always unconditional. That first week, or month, or year, when you’re “learning each other” is when love is unconditional. It’s when you trust someone completely and you idolize someone and you simply think that someone could not be anything less than perfect. It made a perfect sense to name the record Unconditional because blues is unconditional–maybe the most conservative style of all. If you alter it too much it will no longer be blues. And vulnerable as it is, it stands the time. It’s the beauty of the basics, “don’t make it too tidy” kind of thing. It’s absolute, definite, bold and has no boundaries.